It was way back in June 2011 that we first saw Archos' Android based Smart Home Phone. Flip forward to January 2012 and the device is finally available to purchase, coming in at £130 over here in the UK. Archos promises that this is a fully featured Android smartphone, with a wide range of communication applications installed as stock. 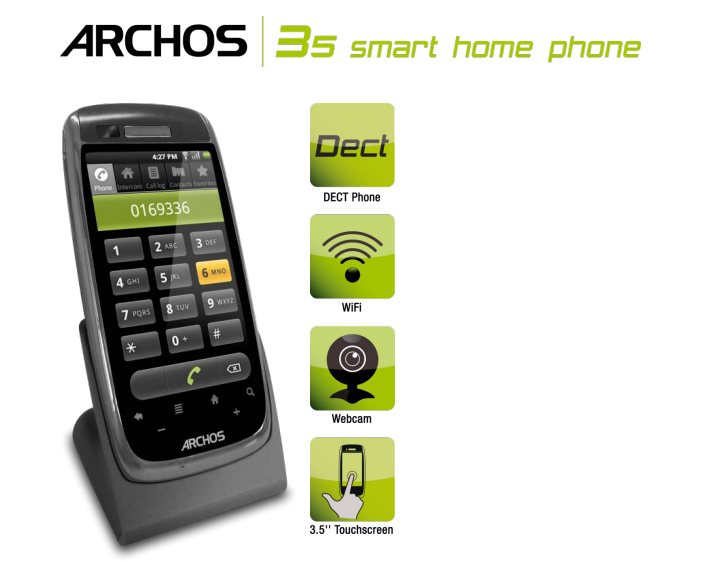 As with several Archos products, the Smart Home Phone does lack official Android Market access. Applications are taken care of via their Appslib service. Aside from apps, the phone is WiFi-enabled, comes with a 3.5-inch touchscreen, 8GB of internal storage and even a front facing camera, possibly a little excessive for a home phone. But, hey, it's running Android. Thats never a bad thing.